We want your trip to be great so we thought we'd share some of the common questions folks have as well as let you know what you should pack. Here's some information you'll need to keep in mind. You'll need to purchase this card first, then get your fishing license . You want to purchase the 8-Day Conservation Fishing License. Purchase your license before your trip - online. Once in Canada, buying a license will be difficult! We have first class rain gear and all weather boots - save the weight, don't pack them! The Fellowship Adventures team is excited that you will be joining us for an unforgettable week of fishing in the wilds of Canada. If you’ve hunted or fished with us before, most of these questions will be familiar. If you’ve never traveled with us though, we know there can be a lot of questions. To reduce stress and help your time with be memorable, we’ve done our best to answer most questions on the website and here. If you don’t find the answer to your question, please don’t hesitate to contact us or your group leader. No need – we’ve got first class gear. We request you purchase your Ontario Outdoor Card and Ontario Non-Resident Fishing License before you depart. You can get them online. You can purchase your license and learn more about fishing in Ontario by following this link to the Ontario Ministry of Natural Resources and Forestry. Is there Phone and Internet Available? We encourage our guest to unplug during their stay with us. Time goes by much too quickly. There is no cell or internet service. We do have multiple satellite phones that can make outgoing calls. You are welcome to use them to check in with home. We practice and support catch and release in our trophy fishery. We keep only the fish we eat at shore lunch each day. Can I get a mount of my fish? FA has a relationship with one of the finest fish taxidermists in the world. From measurements and pictures they will create a replica of your trophy that we believe looks even better than traditional skin mounts and will last for generations. We will have examples of their work and information available at the Lodge. 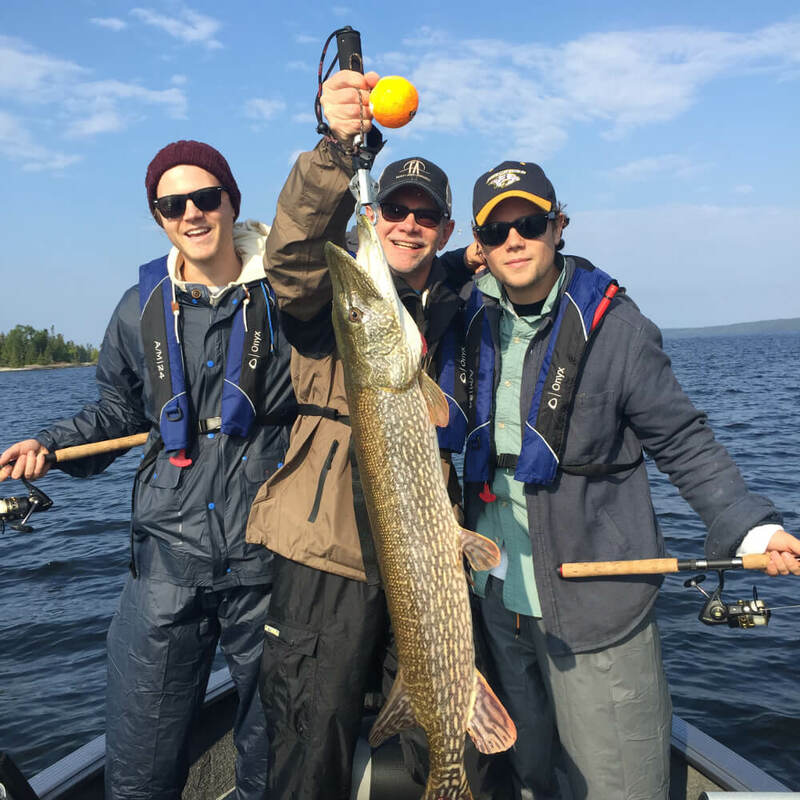 We are excited to have you join us for an unforgettable week of fishing in the wilds of Canada with Fellowship Adventures. Over the years our guests experiences have contributed to our recommended list of gear and preparations. You’ll need to book your flight into International Falls, MN and all flights connect through through Minneapolis-St.Paul International Airport (MSP). You need to arrive on an afternoon flight and depart on afternoon flight. Purchase your Ontario Outdoor Card and Non-Resident Fishing License 30 days before your arrival date. excess weight will incur extra charges. Unfortunately, the best weather and the best fishing don’t always cooperate in Canada, so you need to be prepared for a wide variety of weather. If you’ve been to South Dakota with FA, you know about dressing in layers. We can start fishing in Under Armor and full rain gear and end the day in a T shirt. So, think layering. It literally can go from 30° to 80° in the same day. Comfortable camp clothes and shoes.